Right-Wing Threat on South African Leader Malema's Life? The Presiding Officers of Parliament, led by National Assembly Speaker Ms Baleka Mbete and National Council of Provinces Chairperson Ms Thandi Modise, denounce in the strongest terms the alleged assault of a police officer stationed at Parliament by a Member of Parliament from the Economic Freedom Fighters (EFF). 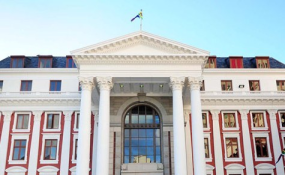 The alleged assault occurred shortly after the adjournment of the joint sitting for the State of the Nation Address (SONA), outside the National Assembly, as the procession, led by the President and the Presiding Officers, was leaving the House. An initial report alleges that Warrant Officer Johan Carstens, responsible for cordoning off the exit area for the procession, faced sudden confrontation and was attacked by the EFF MP, resulting in facial injuries. Officer Carstens has opened an assault case with the police. The Presiding Officers are outraged and disappointed by this shameful conduct by the MP, who, as a public representative, is expected to display exemplary conduct to the rest of society – particularly during an important and decorous occasion such as the SONA. The Presiding Officers will await a full report on the matter in order to determine an appropriate course of action. Copyright © 2019 Parliament of South Africa. All rights reserved. Distributed by AllAfrica Global Media (allAfrica.com). To contact the copyright holder directly for corrections — or for permission to republish or make other authorized use of this material, click here.